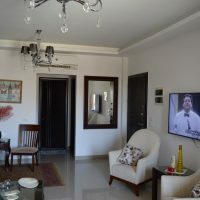 Well maintained, neutrally decorated with modern yet classically designed furnishings is this 3 bed room, 2 bathroom Villa in Sunny Lakes Resort Sharm El Sheikh. Close to the Sunny Club this Villa offers 150 m2 of living space plus roof terrace commanding views of the beautiful and colourful Sinai mountains. A further Balcony adds to the vistas available with access to the many pools on offer at the sunny lakes resort. There is ample parking spaces at the resort which also boasts of restaurants, cafes, shops and a launderette on site. This property is ideal for the family units or groups who likes privacy yet still like to be in the center of it all.